Leave it to eBay to turn up some the oddest homemade vehicles ever imagined. A 2004 Pontiac GTO? No big deal. 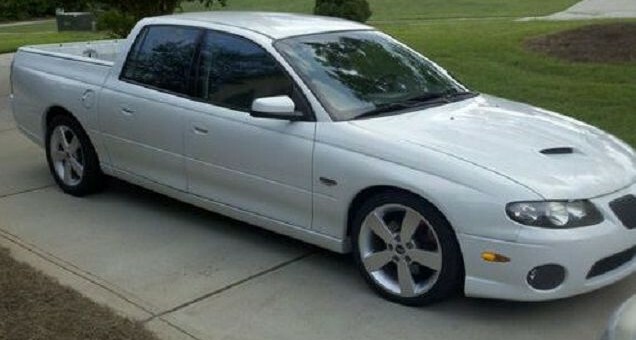 A four-door 2004 Pontiac GTO? There are probably a few of them out there done in the confines of a garage with nothing but a saw and blowtorch. But a 2004 four-door Pontiac GTO with a open bed fused to it? There’s a first. One that has us recalling the confused Rage Face expression of Jackie Chan with his hands frustratingly in the air. But it’s actually not that crazy, as the Holden Ute was sold in Australia with this very body style. All the owner did was swap fascias, and reposition the driver’s seat from the right to the left for American roads. The bidding on the item is currently at $24,000. It features an LS1 V8 under the hood with only 49,500 miles mated to a six-speed manual. Next story Will Opel Build The Next-Gen Citroen DS5, Peugeot 508 In Russelsheim? Not feelin’ it as a GTO. only change is front clip & fenders, all else is factory spec crewman. and gto parts from a salvage yard will fix the conversion, only thing left is the vin, is it legal to register for us roads. I think it would’ve worked better as a GTO stretch limo.